The Earth has distinctive convective behaviour, described by the plate tectonics model, in which lateral motion of the oceanic lithosphere of basaltic crust and peridotitic uppermost mantle is decoupled from the underlying mechanically weaker upper mantle (asthenosphere). 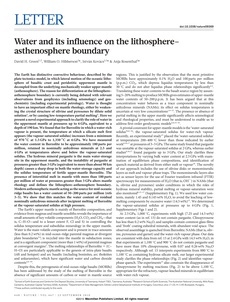 The reason for differentiation at the lithosphere朼sthenosphere boundary is currently being debated with relevant observations from geophysics (including seismology) and geochemistry (including experimental petrology). Water is thought to have an important effect on mantle rheology, either by weakening the crystal structure of olivine and pyroxenes by dilute solid solution1, or by causing low-temperature partial melting2. Here we present a novel experimental approach to clarify the role of water in the uppermost mantle at pressures up to 6 GPa, equivalent to a depth of 190 km. 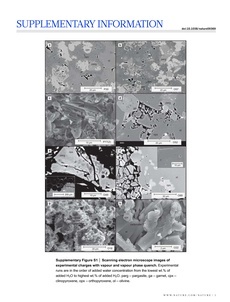 We found that for lherzolite in which a water-rich vapour is present, the temperature at which a silicate melt first appears (the vapour-saturated solidus) increases from a minimum of 970 癈 at 1.5 GPa to 1,350 癈 at 6 GPa. We have measured the water content in lherzolite to be approximately 180 parts per million, retained in nominally anhydrous minerals at 2.5 and 4 GPa at temperatures above and below the vapour-saturated solidus. The hydrous mineral pargasite is the main water-storage site in the uppermost mantle, and the instability of pargasite at pressures greater than 3 GPa (equivalent to more than about 90 km depth) causes a sharp drop in both the water-storage capacity and the solidus temperature of fertile upper-mantle lherzolite. The presence of interstitial melt in mantle with more than 180 parts per million of water at pressures greater than 3 GPa alters mantle rheology and defines the lithosphere朼sthenosphere boundary. Modern asthenospheric mantle acting as the source for mid-oceanic ridge basalts has a water content of 50�0 parts per million (refs 3�. We show that this matches the water content of residual nominally anhydrous minerals after incipient melting of lherzolite at the vapour-saturated solidus at high pressure.